For easy repair of bare patches in full sun and dense shade alike, look to Scotts® EZ Seed. This 3-in-1 mix combines a unique combination of super-absorbent mulch, high performance grass seed and slow release fertilizer. Simply prep, apply, water and watch a gloriously lush lawn unfold. Prepare the area where you want to grow grass by removing dead grass and loosening hard soil to help tiny seedlings root. For bare patches, apply Scotts® EZ Seed® so the area is mostly covered*, but bare ground is still visible and seed contacts the soil. The mulch will expand 4X upon watering to help cover the seed and keep it moist. (Use half as much for repairing thin areas.) Only apply the recommended amount so that seedlings have enough space to access water and nutrients. * For patching bare spots use 1 kg/2.32 sq. metres (1 lb/12.5 sq. feet). For overseeding thin spots use 1 kg/4.65 sq. metres (1 lb/25 sq. feet). A deep and thorough initial watering is the key to success. 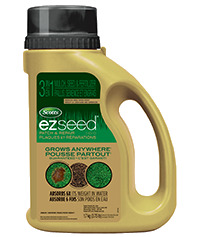 Gently water the area until Scotts® EZ Seed® is completely saturated and no more water is being absorbed; mixture will turn dark brown (this may take several minutes). Avoid pooling water. When mixture begins to turn light brown, it's time to water again. Keep children, pets and lawn mowers off newly planted seedlings until the grass is 7.5 cm (3 inches) high. Seed germinates best when daytime temperatures are between 15°-26°C (60° to 80°F) and seeded area receives an average of 4 hours or more of sunlight per day. Patch and repair solution that grows anywhere, GUARANTEED! Scotts No Quibble Guarantee: If for any reason you, the consumer, are not satisfied after using this product, you are entitled to get your money back. Simply send us evidence of purchase and we will mail you a refund cheque promptly. For our mailing address or to contact our Consumer Help Center click here.